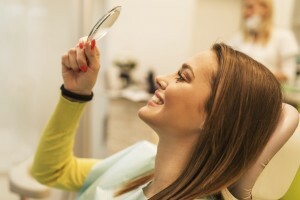 Nobody wants a mouth filled with dark metal, which is just one of the reasons we love composite fillings here at Advanced Dentistry of Scarsdale. Made from a durable resin mixture, composite fillings have come a long way since their inception over twenty years ago. Composite resin fillings placed in the 1990s weren’t strong enough to be placed in the back teeth, but all of that has changed. Nowadays, composite resin fillings, also called tooth colored or white fillings, are better than ever. Composite resin fillings are nearly invisible to the naked eye when placed by your Westchester cosmetic dentist. Composite fillings are available in a wide range of shades, allowing our clinicians to closely match the filling color to the shade of your natural teeth. Also, since composite material is slightly transparent, it mimics the natural opacity of your teeth, creating a restoration that blends in perfectly. For this reason, composite fillings can be used anywhere in the mouth without compromising aesthetics. In addition to looking great, composite resin fillings also help dentists to keep the teeth healthy and strong. Unlike amalgam fillings, which essentially “sit” inside of the tooth, composite fillings are designed to bond with the enamel and dentin of the tooth, sealing out future decay. Teeth do not require “undercuts” to keep the fillings in place, preserving more of the natural tooth. Composite fillings cure in seconds, restoring as much as 95% of the original strength and stability to the tooth. To top it off, composite fillings are inexpensive and easy to repair if they ever become damaged. Having composite resin fillings placed is only a little different from the traditional procedure. After the decay has been removed from the tooth, the area will be cleaned and sanitized. Next, a mild acidic compound will be painted onto the area in order to improve adhesion between the composite and the tooth. After that has been washed away and dried, the composite material is piped into place, and a handheld UV light is used to cure the filling. There is a reason that our clinicians at Advanced Dentistry of Scarsdale are known as some of the best dentists in Westchester County. You won’t believe how good composite resin fillings look. For more information about these powerful restorations, contact us today!